Fine pruning a pine tree. This entails the removal of dead, dying, diseased, crowded, weakly attached, and low vigor branches from the crown of the tree. selective removal of branches to increase light penetration and air movement through the crown. Thinning opens the foliage of a tree, reduces weight on heavy limbs, and helps retain the trees natural shape. This is the term we use for removing the lower branches from a tree in order to provide clearance for buildings, vehicles, pedestrians, and views. Reducing the size of the tree, often for clearance of utility lines or views. Reducing the height or spread of a tree is best accomplished by pruning back the leaders and branch terminals to lateral branches which are large enough to assume terminal roles. We do not top trees as this procedure, used by what we refer to as “hackers” stresses trees. Removal of the leaf- bearing crown can temporarily starve a tree, triggering a survival mechanism which forces the rapid growth of multiple shoots below each cut, roots also grow frantically. These shoots break easily, especially during windy conditions. Topping also permanently ruins the tree’s aesthetic beauty. Some trees act like sails in a strong wind, this could cause limbs to break and fall and whole trees to collapse if the roots are shallow. We selectively remove branches, keeping the shape of the tree but allowing movement of air through the crown. This is the most effective way to remove a stump. A stump grinding machine mechanically grinds stumps below the soil line up to 18″ in depth, depending on the machine. This process only takes a few minutes and leaves a hole where the stump used to be. Cable and bracing is a support system for trees which require additional support and stability. 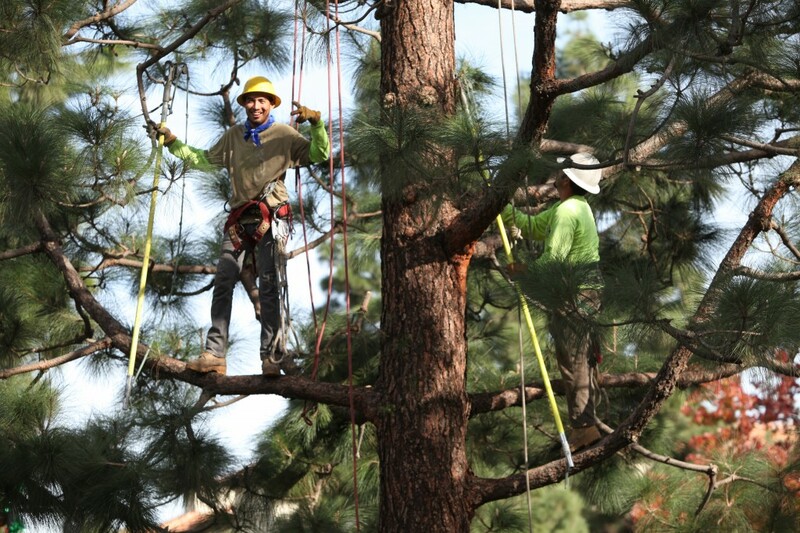 This procedure can be a preventative measure to insure the longevity and stability of your tree. Most trees require Deep Root Fertilization DRF because trees in urban landscapes are actually existing in a foreign environment. DRF is a method of injecting fertilizer directly into the root system. This provides your trees or shrubs the beneficial nutrients needed to fight off pests, disease and environmental stress. We perform this service annually for our customers with excellentresults in terms of increased immune system, strengthened roots systems and cell structure with increased blooms and greener denser foliage. It is important to fertilize before the warning of nutrient deficiency is visible and you trees’ health has become compromised. As a Certified Arborist Jon can diagnose your trees’ situation and recommend the optimum time to fertilize, if required. IPM Integrated Pest Control, is an effective and environmentally sensitive approach to pest management. It is used to manage pest damage by the most economical means, and with the least possible hazard to people, property and the environment. We offer a complete range of IPM services and solutions. We also offer a direct inject solution to diseases, to manage tree growth, reduce fruiting and seeding and enhance tree health.